On January 24, 2017, Jamie was driving to work on Park Avenue in Bronx, New York. She saw the red light as she was approaching the cross street of Claremont Parkway, and stopped behind the car in front of her (which happened to be a police vehicle). Jamie was waiting for the light to turn green, when suddenly, she was rear-ended by a driver that failed to stop. Jamie remembered holding her foot on the brake and still crashing into the rear of the police car in front of her. At that moment, the airbags in Jamie’s car deployed. She immediately panicked, thinking that her children were in the back seat – thankfully they were not. Jamie’s right knee and head hurt, but she did not think she needed to go to the hospital right away. Her pain grew worse the next day, so she went to the emergency room. As a result of the accident, Jamie suffered injuries to her neck, mid/lower back, and right knee. She described the worst area of pain in her mid/lower back, as aching and constant with radiating pain to the lower right extremity. Her neck pain was described as aching and intermittent with radiating pain to the upper left extremity; and her right knee pain was constant with exacerbations. When her pain did not improve with several weeks of physical therapy, Jamie was required to undergo Lumbar and Cervical Epidural Steroid Injections. Jamie listened to her sister-in-law who referred her to The Case Handler team! 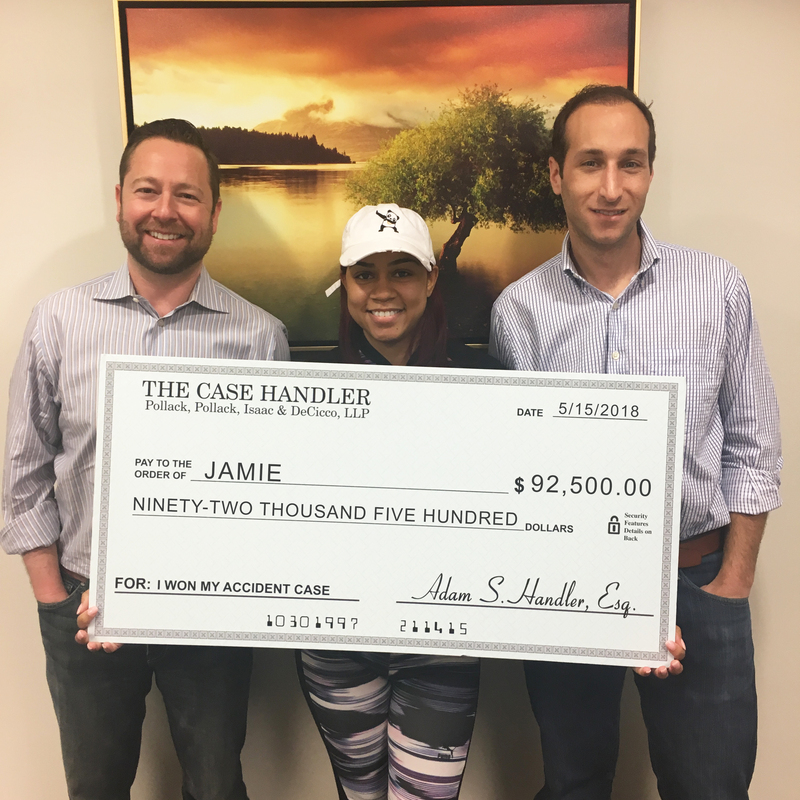 Although Jamie technically rear-ended a cop car, The Case Handler team made sure that she was not held liable and our team ensured that her medical bills were taken care of. With our help, Jamie successfully recovered $92,500.00 from Ameriprise Insurance Company! “She had a big case and we resolved it the best way possible; as quickly as possible. It was a true team effort with an excellent result,” said Adam Handler.